In today’s healthcare climate, CRNAs are the key to the future of anesthesia care, as there is an increasing demand for highly qualified, non-MD/DO healthcare specialists who can ensure access to patient care that is both extremely safe and cost-effective. The Future of Nursing: Leading Change, Advancing Health, Institute of Medicine of the National Academies. (2010), Report Brief. In this report, the Institute of Medicine (now the National Academy of Medicine) recommends that nurses should be allowed to practice to the full extent of their education and training, and should become full partners with physicians and other healthcare professionals in redesigning healthcare in the United States. Certified Registered Nurse Anesthetists (CRNAs) correlated with lower-income populations, where anesthesiologists correlated with higher-income populations. Furthermore, CRNAs correlated more with vulnerable populations such as Medicaid-eligible patients. Assuring the population has adequate insurance is one of the hallmark achievements of the Affordable Care Act (ACA). Removing barriers to CRNA scope of practice to maximize CRNA services will facilitate meeting the demand by vulnerable populations after full implementation of the ACA. Cost Effectiveness Analysis of Anesthesia Providers, Nursing Economic$, Hogan P, Seifert R, Moore C, Simonson B. (2010; updated 2016). 28, 3:159-169. The research results from this landmark study show that as the demand for healthcare continues to grow, increasing the number of CRNAs and permitting them to practice in the most efficient delivery models will be key to containing costs while maintaining quality care. Additionally, the researchers confirmed that CRNAs are significantly less costly to educate and train than anesthesiologists. The research results suggest that there is strong evidence of differences in the likelihood of anesthesia complications by patient characteristics, patient comorbidities, and the procedures being administered, but virtually no evidence that complication rates differ based on anesthesia provider scope of practice or anesthesia delivery model. Participants represented urban (23%) and rural (77%) practices, as well as office/clinic (31%), hospital (62%) and mixed (7%) practice settings. Research results showed that CRNAs were able to safely and effectively perform fluoroscopic guided LESIs with complication rates similar to physician rates cited in the literature. Physician Anaesthetists Versus Non-Physician Providers of Anesthesia for Surgical Patients, Lewis SR, Nicholson A, Smith AF, Alderson P. (2014). Cochrane Database of Systematic Reviews 2014, Issue 7. Art. No. : CD010357. DOI: 10.1002/14651858.CD010357.pub2. This literature review determined that no definitive statement can be made about the possible superiority of one type of anaesthesia care over another. No Harm Found When Nurse Anesthetists Work Without Supervision by Physicians, Dulisse B. Cromwell J. (2010), Health Affairs, 29:1469-1475. Analysis of seven years of Medicare inpatient anesthesia claims reveals that the change in CMS policy allowing states to opt out of the physician supervision requirement for Certified Registered Nurse Anesthetist reimbursement was not associated with increased risks to patients. Anesthesia Staffing and Anesthetic Complications During Cesarean Delivery, Simonson D, Ahern M, Hendry M. (2007), Nursing Research, 56, 9-17. There is no difference in rates of complications between the two types of staffing models: anesthesia provided solely by CRNAs versus solely by anesthesiologists. As a result, hospitals and anesthesiology groups may safely examine other variables, such as provider availability and costs, when staffing for obstetrical anesthesia. Anesthesia Provider Model, Hospital Resources and Maternal Outcomes, Needleman J, Minnick AF (2009), Health Services Research, 44(Part I)464-82. Hospitals that use only CRNAs, or a combination of CRNAs and anesthesiologists, do not have systematically poorer maternal outcomes compared with hospitals using anesthesiologist-only models. 1. Safety First: CRNAs are highly trained anesthesia professionals who safely administer more than 45 million anesthetics to patients each year in the United States, according to the AANA 2017 Practice Profile Survey. 2. Rural America: CRNAs are the primary providers of anesthesia care in rural America, enabling healthcare facilities in these medically underserved areas to offer obstetrical, surgical, pain management and trauma stabilization services. In some states, CRNAs are the sole providers in nearly 100 percent of the rural hospitals. 3. Military Presence: Nurse anesthetists have been the main providers of anesthesia care to U.S. military personnel on the front lines since WWI. Nurses first provided anesthesia to wounded soldiers during the Civil War. 4. Practice Settings: CRNAs practice in every setting in which anesthesia is delivered: traditional hospital surgical suites and obstetrical delivery rooms; critical access hospitals; ambulatory surgical centers; the offices of dentists, podiatrists, ophthalmologists, plastic surgeons and pain management specialists; and more. 5. Cost-Efficiency: Managed care plans recognize CRNAs for providing high-quality anesthesia care with reduced expense to patients and insurance companies. The cost-efficiency of CRNAs helps control escalating healthcare costs. 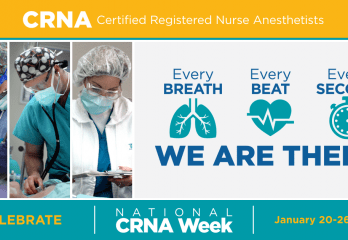 CRNAs’ emphasis on safe, effective anesthesia care highlights one of the many hallmarks of nurse anesthesia; in fact, it is the motto of the American Association of Nurse Anesthetists (AANA). Founded in 1931 and located in Park Ridge, Ill., and Washington, D.C., the American Association of Nurse Anesthetists (AANA) is the professional organization representing nearly 53,000 Certified Registered Nurse Anesthetists (CRNAs) and student registered nurse anesthetists across the United States. For more information, visit www.aana.com/ and www.future-of-anesthesia-care-today.com.